Most recently, we have experienced an uptick in market activity. In fact, in King and Snohomish counties we saw a 53% increase in pending sales from December to January. While it is seasonally normal to see activity increase at the first of the year, it was 16% higher than the previous January. This increase is being driven by multiple factors, such as our thriving economy and job market, price acceleration softening, and the recent decrease in interest rates. Currently, rates are as low as 4.5% for a 30-year fixed conventional mortgage – 0.75 points down from the fourth quarter of 2018. In fact, the interest rate in November was the highest we’ve seen in five years! The current rate level is the lowest we have seen in a year. This is meaningful because the rule of thumb is that for every one-point increase in interest rate, a buyer loses ten percent in purchase power. For example, if a buyer is shopping for a $500,000 home and the rate increases by a point during their search, in order to keep the same monthly payment, the buyer would need to decrease their purchase price to $450,000. Conversely, for every decrease in interest rate, a buyer can increase their purchase price and keep the same monthly mortgage payment. Why is this important to pay attention to? Affordability! If you take the scenario I just described and apply it to the link above, you can see that the folks who choose to jump into the market this year will enjoy an interest cost savings when securing their mortgage. This lasts the entire life of the loan and can have a huge impact on the monthly cash flow of a household. This cost savings is also coupled with a slow-down in home-price appreciation. Complete year-over-year, prices are up around 8% in both King and Snohomish counties, but note that from 2017 to 2018 we saw a 14% increase. Price appreciation is adjusting to more normal levels and is predicted to increase 4-6% in 2019 over 2018. 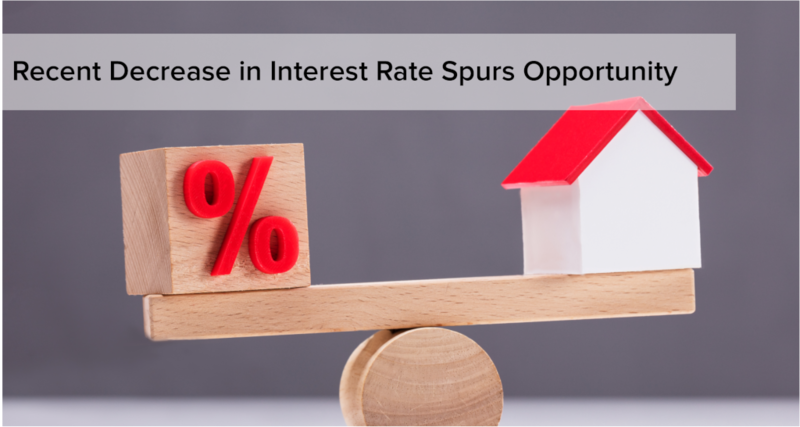 As we head into spring market, the time of year we see the most inventory become available, the interest rates will have a positive influence on both buyers and sellers. Naturally, buyers will enjoy the cost savings, but sellers will enjoy a larger buyer pool looking at their homes due to the demand the lower rates are creating. Further, would-be sellers who are also buyers that secured a rate as low as 3.75% via a purchase or re-finance in 2015-2017, will consider giving up that lower rate for the right move-up house now that rates are not as big of a jump up as they were during the second half of 2018. This recent decrease in rate is making the move-up market come alive. What is great about this, is that it opens up inventory for the first-time buyer and helps complete the market cycle. First-time buyers are abundant right now as the Millennial generation is gaining in age and making big life transitions such as buying real estate. According to Nerd Wallet, 49% of all Millennials have a home purchase in their 5-year plan. Will these rates last forever? Simply put, no! According to Matthew Gardner, Windermere’s Chief Economist, rates should increase into the 5’s in 2019. While still staying well below the 30-year average of 6.85%, increases are increases, and securing today’s rate could be hugely beneficial from a cost-saving perspective. Just like the 1980’s when folks were securing mortgages at 18%, the people that lock down on a rate from today will be telling these stories to their grandchildren. Note the 30-year average – it is reasonable to think that rates closer to that must be in our future at some point. So what does this mean for you? If you have considered making a move, or even your first purchase, today’s rates are a huge plus in helping make that transition more affordable. If you are a seller, bear in mind that today’s interest rate market is creating strong buyer demand, providing a healthy buyer pool for your home. As a homeowner who has no intention to make a move, now might be the time to consider a refinance. What is so exciting about these refinances, is that it is not only possible to reduce your monthly payment, but also your term, depending on which rate you would be coming down from. If you would like additional information on how today’s interest rates pertain to your housing goals, please contact me. I would be happy to educate you on homes that are available, do a market analysis on your current home, and/or put you in touch with a reputable mortgage professional to help you crunch numbers. Real estate success is rooted in being accurately informed, and it is my goal to help empower you to make sound decisions for you and your family. 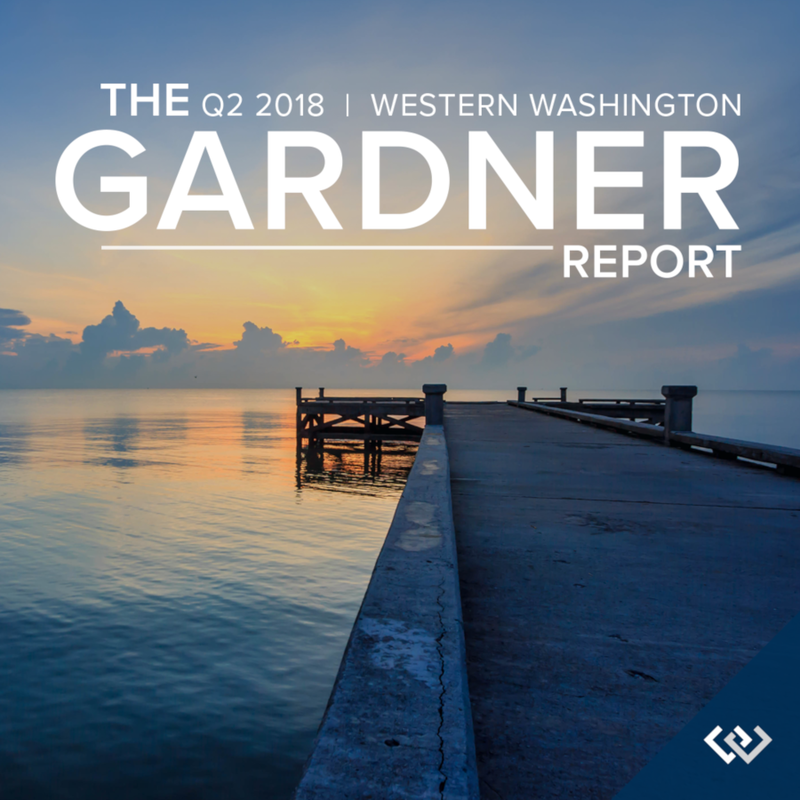 I am pleased to present the fourth-quarter 2018 edition of the Gardner Report, which provides insights into select counties of the Western Washington housing market. 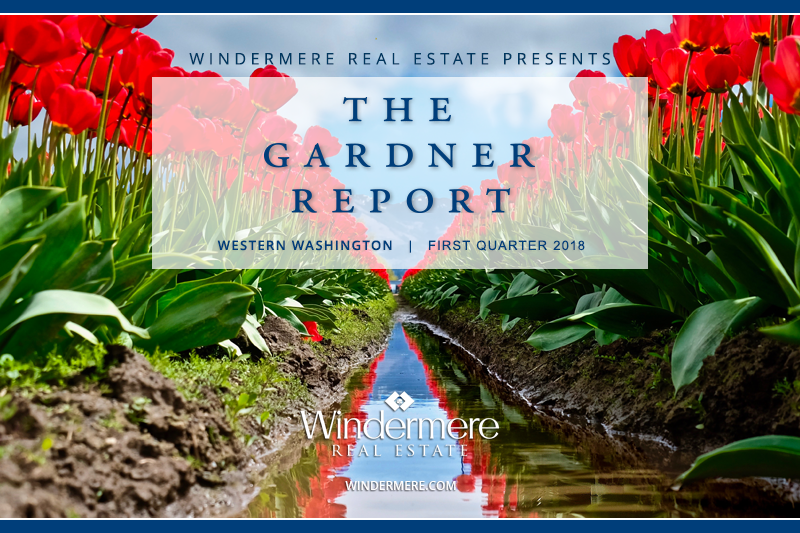 This analysis is provided by Windermere Real Estate Chief Economist Matthew Gardner. I hope that this information will assist you with making better-informed real estate decisions. For further information about the housing market in your area, please don’t hesitate to contact me. Happy 2019! 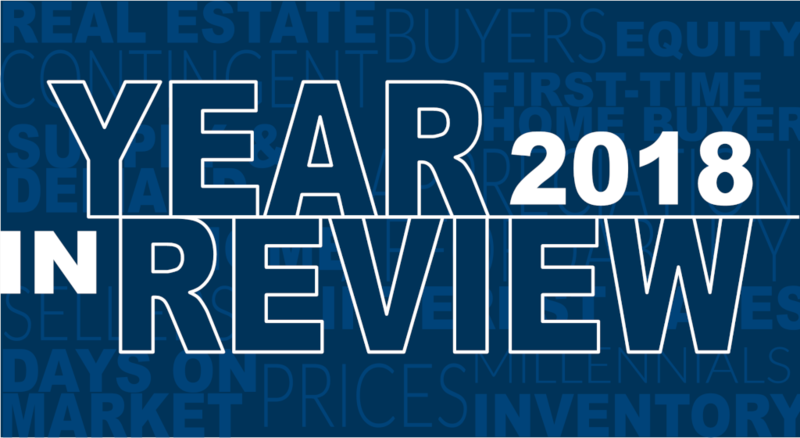 As we head into the New Year, it’s a great time to look ahead to what the real estate market has in store. 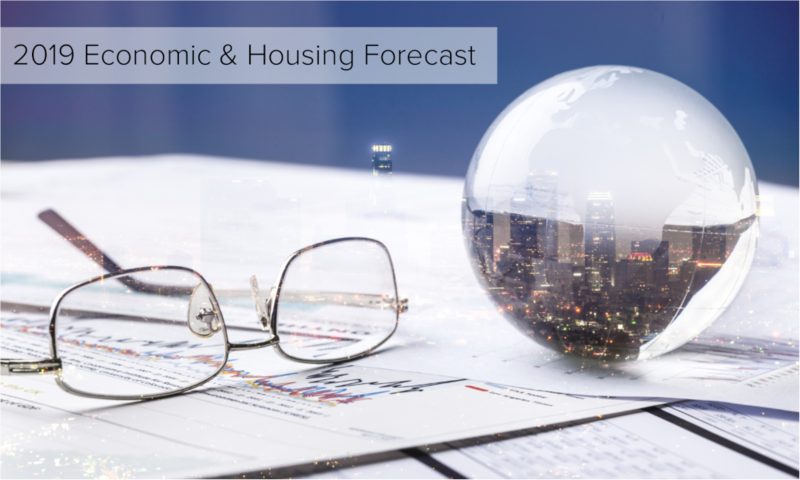 Just last week, I had the pleasure of hosting an Economic Forecast Event with Windermere’s Chief Economist, Matthew Gardner, and soaked up his knowledge and predictions. Below are his general predictions for the at-large real estate market across the nation. Please review and let me know if you have any questions. Beyond the national forecast, at the event Matthew reported specifically on the Greater Seattle market, including both King and Snohomish counties. I received his Power Point presentation and I am happy to share his slides, should you request them. Seattle remains strong economically and our job market is thriving. Interest rates are still historically low and will rise, but not beyond 6%. It is still a seller’s market in our area, but price escalations are softening, creating more balance and sustainability. We are NOT experiencing a bubble. 25% of homeowners in our region have 50% equity in their homes. An economic recession is upon us in 2020. This one should be much like the 1991 recession; short and not based in housing. Be careful how you process the media’s take on the market as they often use extreme month-over-month numbers vs. richer long-term data. Prices are expected to rise 5-7% in 2019, which is more normal, but above the long-term average, yet lower than the recent double-digit year-over-year gains we’ve seen since 2012. It is always my goal to help empower my clients with information to help them make informed decisions regarding their real estate. Let me know if you’d like that Power Point. I’m happy to share and help you dissect the information. Here’s to a great 2019! At Windermere we help people buy and sell homes, but we also help build community. 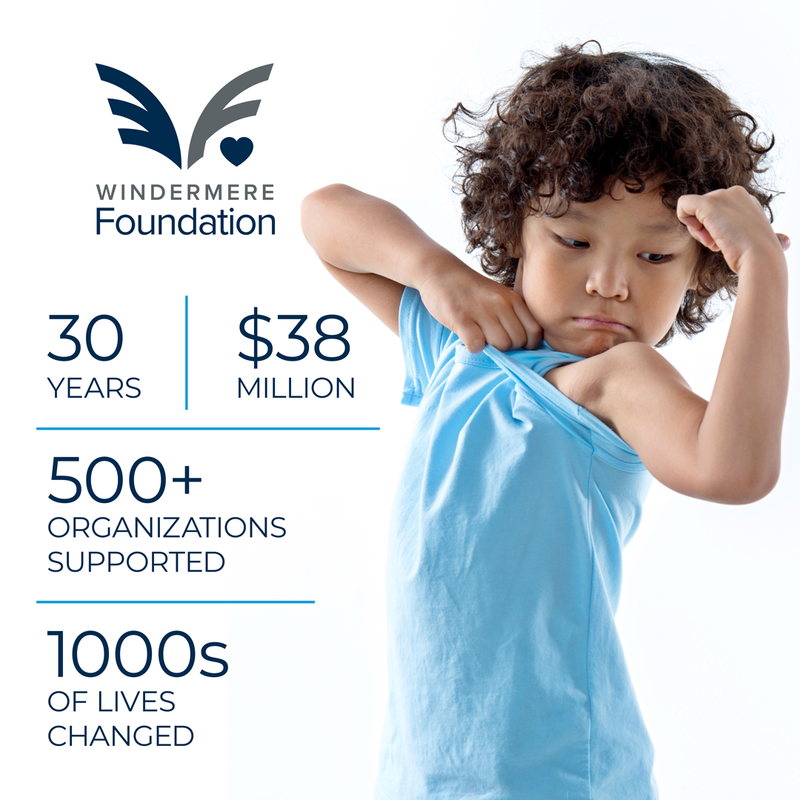 I’m proud to support the Windermere Foundation with every home I help sell or buy. 2018 concluded with another great year of fundraising and giving for the Windermere Foundation, thanks to the continued support of agents, franchise owners, staff, and the community. Nearly $2.5 million was raised in 2018, bringing our grand total to over $38 million raised since the Foundation’s inception in 1989! This money goes right back into our community, helping low-income and homeless families. Read the full blog post here. This past Christmas, my office adopted 22 foster boys, ranging in age from 13-18 years old, and living in group homes managed by Pioneer Human Services. These group homes serve boys who are struggling with emotional, behavioral and/or psychiatric problems that prevent placement in a traditional foster care setting. We purchased gifts, using wish lists from the boys, to help provide a joyful Christmas morning for these teenage boys who might otherwise be overlooked. The office also raised money for grocery gift cards for families in need (also referred by Pioneer Human Services). This year we distributed $2,068 in grocery gift cards to 15 local families. 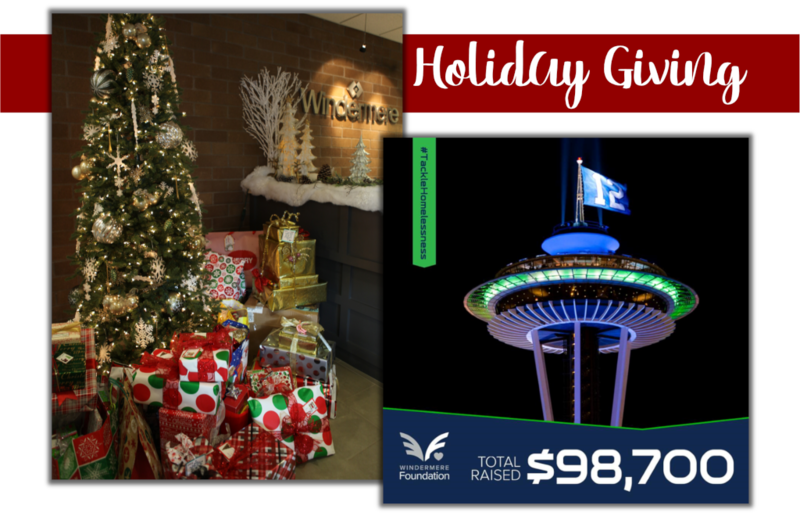 We are also thrilled to report that through our partnership with the Seattle Seahawks, this season Windermere raised a total of $31,900 for YouthCare, an organization that provides critical services for homeless youth. This brings our three-year total to $98,700 towards our #tacklehomelessness campaign! 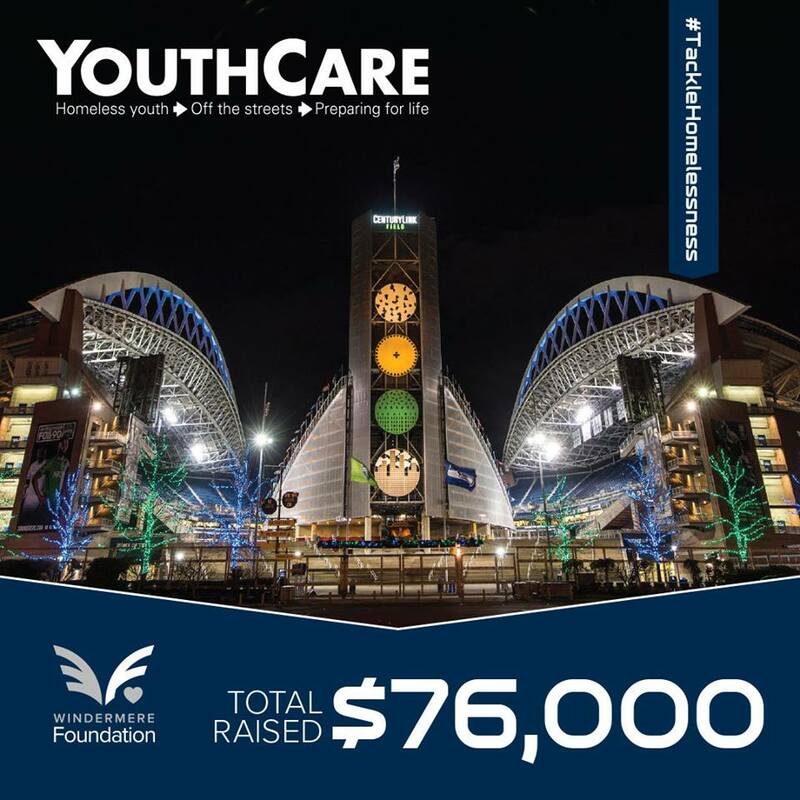 Thank you to the Seahawks and to YouthCare for helping us support homeless youth in our community. We’ll be back next year to raise even more! With a healthy increase in inventory since May, the need for buyers to have all their down payment funds immediately available, and a willingness to make offers with no contingencies has passed in most cases. It has been quite a relief, and is providing opportunities for many folks that have wanted to cash in on their well-developed equity levels, and either move up to a bigger home or down size (right size) to a home that better fits their current lifestyle. 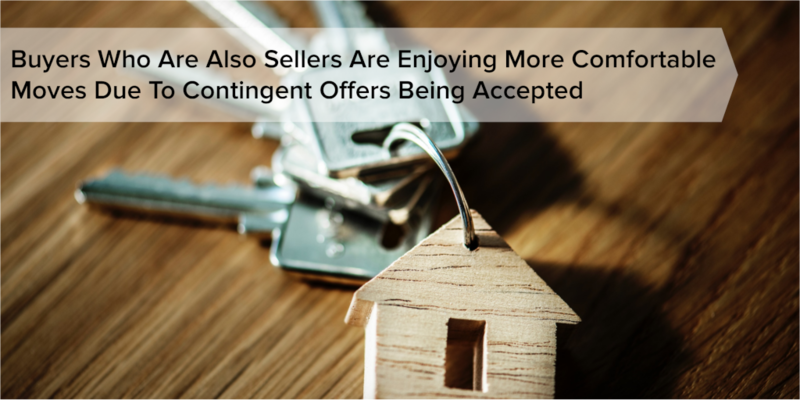 For the first time in years we are starting to see an increase in contingent offers that are turning into pending transactions. A contingent sale is one where a buyer makes an offer to purchase their next home contingent on the sale of their current home. In some cases, the buyer’s current home may be already on the market, or in other cases they still need to launch their home to the market. Many buyers in this situation wait to find a home/seller that is willing to accept their contingent offer, and then they immediately launch their home onto the market. The goal is a sale within 30-45 days, which will then provide the buyer with their down payment funds, and then close both properties within days of each other, making a smooth transition from one house to the next. We have not seen inventory levels the way they are now since late 2014, so the opportunity for successfully executing a contingent offer has not been an option for 4 years! It is a great time to seize this opportunity. With that said, let’s look at some statistics which highlight some of the gains there are to be had. First and foremost, let’s look at year-over-year price appreciation. 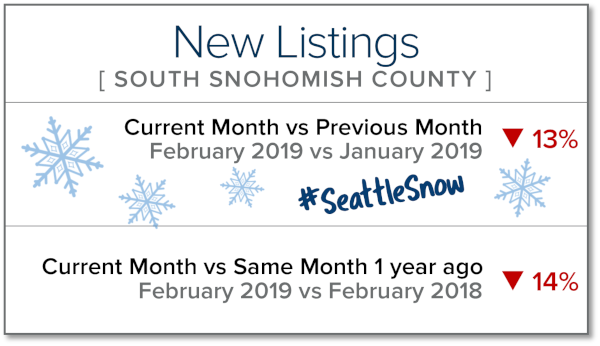 Over the last 12 months, we have seen an 11% increase in prices in both King and Snohomish Counties. Last year, the year-over-year price appreciation was 14% for both counties. This illustrates that price appreciation is slowing, or softening, if you will, due to the increase in inventory levels. This is a welcome trend as we move away from unsustainable appreciation levels, which is helping to stabilize affordability. Bear in mind that a historically-normal appreciation rate is 3-5%, so we are still a ways away from reaching that baseline. The current market environment for both counties is still a seller’s market, sitting at 2.6 months of inventory based on pending sales for King, and 2.3 for Snohomish. A balanced market is representative of 3-6 months on inventory; we are currently just under that, but well above the extreme 0.5-0.8 months that we experienced over the last year or so. This has created more selection, which has minimized multiple offers and given buyers the opportunity to write offers with more comfortable terms, such as a home sale contingency. Lastly, let’s talk interest rates! Currently, they are hovering around 5%. Yes, this is up from the 4.5% we saw earlier this year, but still well below the 30-year historical average of 6.7%. Money is still relatively cheap to borrow, and this should be taken advantage of as experts predict interest rates to rise as we head into 2019 and beyond. Your interest rate is typically fixed for the life of your loan, so rate plays into the long-term savings you can have on your asset if locked in at today’s levels. If you have thought about making a move to a home that is a better fit for your current lifestyle, but have been stalled because you weren’t sure how to do it, now is the time to consider your options. Please reach out if you’d like a review of the current market conditions and how they relate to your goals. It is my goal to help keep my clients informed and empower strong decisions. Choosing a color palette for your home can be a complex process. Whether you are refreshing the interior or exterior, identifying colors that you relate to and that are on trend can be a challenge. Check out this article from House Beautiful on the most popular color palettes for 2019 based on your color personality. I think there is a lot of fun to be had here, and remember – a couple coats of paint can be the most inexpensive way to refresh your home. If you need a painter or any other contractor, remember that I can be a resource, as I have a preferred contractors list that I can pull from. Every play matters in the fight against homelessness! Congratulations to the Seattle Seahawks for helping us raise $4,600 to #TackleHomelessness in their last home game against Los Angeles. That brings our season total to $9,200 and our cumulative money raised to $76,000! Good luck to the Hawks this weekend against the Chargers! With the sharpest increase of available homes for sale in years, more opportunities are now available for buyers, including first-timers. Many first-time home buyers have sat on the sidelines and remained renters due to the constriction of inventory, which put major pressure on price affordability. Not only has affordability been an issue, but the terms required to prevail in a multiple-offer situation were often not within reach for someone entering the market for the first time. For example, over the last 12 months in the Seattle Metro area we have seen a 66% increase in the selection of homes for buyers to choose from. There is currently 1.8 months of available inventory based on pending sales versus 0.8 months that was available the same month last year. This is still a seller’s market (0-3 months), but it is providing more than twice as much selection than a year ago. This loosening up of the market has helped to temper price growth by reducing the amount of price escalations and the need to have super aggressive financing terms in order to secure a home. You see, over the last 3-4 years we have experienced double-digit price appreciation (10-14%) year-over-year, each year. A normal rate of appreciation is 3-5%. Minimal amounts of available inventory, low interest rates, and rapid job growth lead to this increase in prices. Now that more homes are coming to market and job growth has stabilized a bit (still growing, but not as fast), price growth has slowed. This is good news for sustainability and affordability. Here’s the deal though – we are still experiencing growth in values, making home ownership a sound investment over renting. According to the most recent survey from rentcafe.com, the average rent for an apartment in Seattle is $1,906 with an average square footage of 736 sq. ft. That is quite a bit of money for not a ton of space. Further, that monthly expenditure does not create any wealth for the renter, only for the landlord. With renting, rates can be increased at any time, and you are paying down someone else’s asset, not your own. 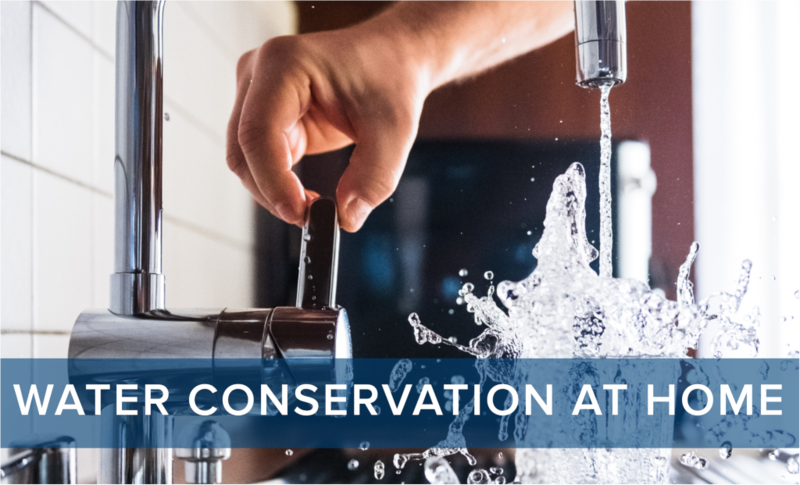 Also, owning gives the homeowner control of their overhead, while getting to make their house their home by adding improvements such as painting. There are several factors to consider that will lead a person to make the best decision for their lifestyle and their financial bottom line. One of the biggest factors is interest rates! Currently, the rate for a 30-year fixed, conventional, conforming loan is hovering around 4.88%. Up from earlier this year and predicted to rise, but still historically low over the course of the last 30 years. These rates need to be considered the greatest opportunity of them all! With prices tempering and rates still under the 30-year average of 6.65%, buyers are able to secure a sound investment with very low debt service. With interest rates predicted to rise over the next year, a good rule of thumb to remember is that for every one-point increase in rate, a buyer loses 10% of their buying power. For example, if the rate jumps from 4.75% to 5.75% and one wants to keep the same monthly payment, they must adjust their price point down by 10%. So, a $450,000 budget becomes a $405,000 budget, and that isn’t taking appreciation into consideration. If you assume an average appreciation rate of 4% year-over-year, today’s $450,000 house will be $468,000 next year. What side of the equity growth do you want to be on? As an owner now, or a buyer a year from now, when prices are higher and interest rates are most likely higher as well? Once you secure a mortgage, the payment stays the same over the term of the entire loan. The long-term benefits of owning are abundant, including the stability of not being asked to move. These are important factors to consider for everyone, but especially millennials, who are enjoying the benefits of Seattle’s attractive job market. One myth to address is the common belief that you must have a 20% down payment in order to buy a home. That is simply not true. There are loan programs as low as 3% down, decreasing the need to have a large sum of money saved up before being able to buy. Where folks are having to compromise the most due to affordability is commute times, and settling in less-urban neighborhoods. Worth pointing out, is the average home price in south Snohomish County is 34% less than Seattle Metro – that is a huge savings! Further, south King County is 74% more affordable than Seattle. Some people, mainly millennials, have not been willing to give up living in the core urban neighborhoods that have high walk scores and shorter commute times. That should be apt to change with more selection available in the purchase market, coupled with low interest rates. The advantages of moving out a little further and securing a home will start people on the track of building long-term wealth. If you or anyone you know is currently renting and is considering a change, please let me know, as I would be happy to get their questions answered and help them make an informed decision. Two Weeks Ready: Be Prepared. Build Kits. Help Each Other. The first few days after a disaster are often the most critical. Government and essential services may not be available right away, depending on the circumstances. It is imperative to have a plan in place for such a time, and be ready to act on your own. Washington’s biggest disaster threat is from earthquakes. 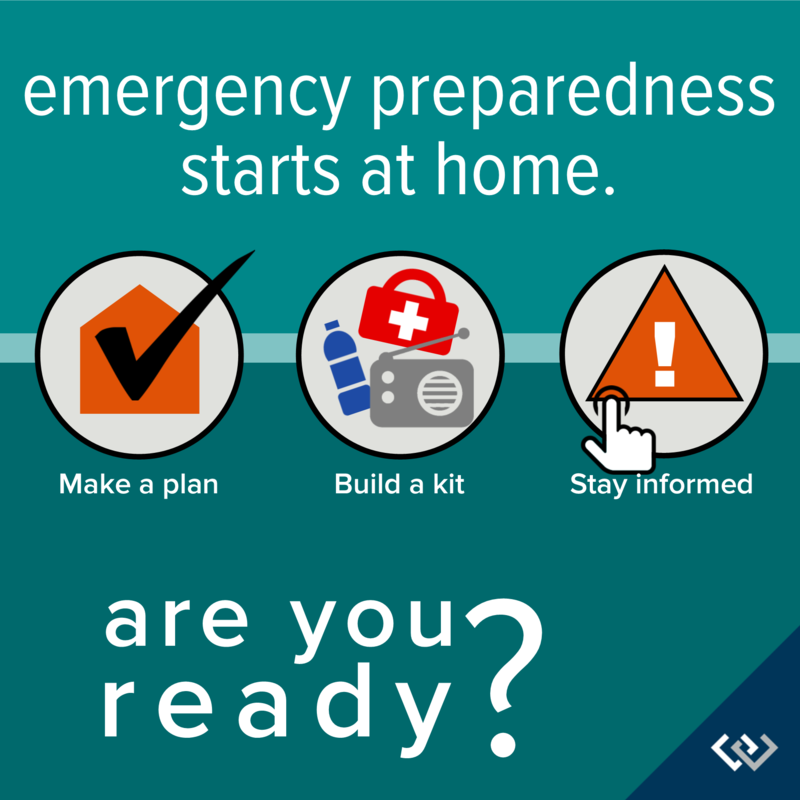 Washington State’s Emergency Management Division advises that we take precautions to be on our own for at least 2 weeks. Take a look at their Two Week Ready Brochure (PDF) that outlines the basics necessary for your emergency kit. 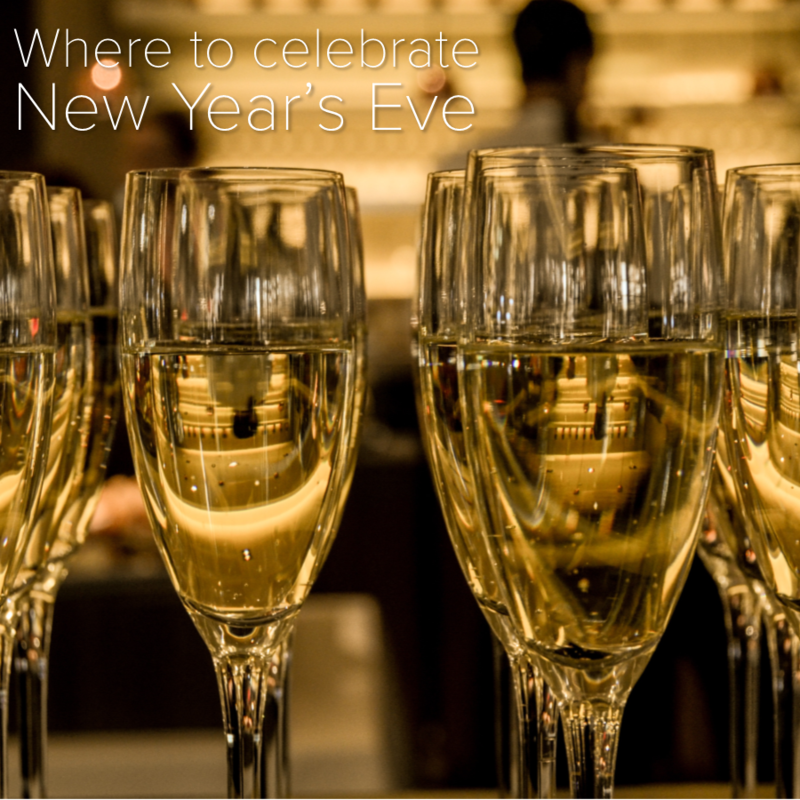 While it is important to get ready, don’t feel like you have to do it all at once. The list of necessities is long, so take a look at the agency’s year-long prep plan. You will also find information on pet preparedness, as well as the agency’s Drop, Cover, and Hold Earthquake Scenario map. 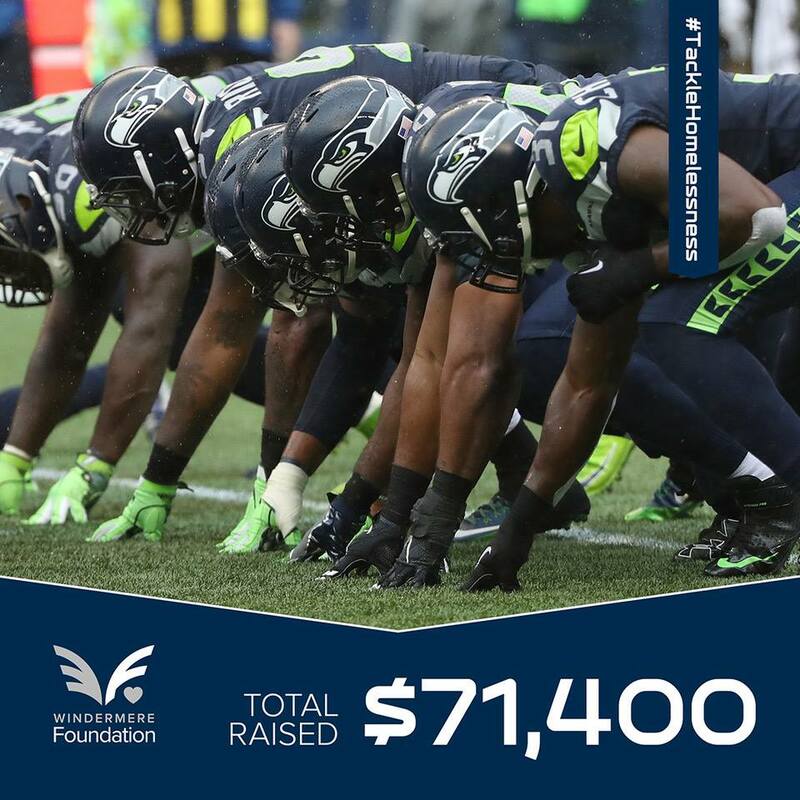 During last weekend’s win against Dallas, the Seattle Seahawks had 46 defensive tackles, raising another $4,600 for Windermere’s #TackleHomelessness campaign. Combined with what we’ve raised over the past two seasons, this brings our to-date grand total to $71,400! All season long we’ll be partnering with the Seahawks to raise money for YouthCare in support of homeless youth. “How’s the Market?” is a question I am asked all the time. It is a common segue in casual conversation over the neighbor’s fence, at a cocktail party or family gathering. Now more than ever, the answer to this question is critical, yet fascinating. You see, our market is experiencing a long-awaited correction, a tempering of price appreciation. This is providing great opportunities for both buyers and sellers. For so long, inventory has been so limited that prices have had nowhere else to go but up, and up fast! In May, we saw the largest jump in new listings in a decade, which created a slowdown in month-over-month price appreciation. This was especially exacerbated due to the scarcity of inventory in the first quarter of the year when many jobs were being filled by big companies in the area, skyrocketing demand. 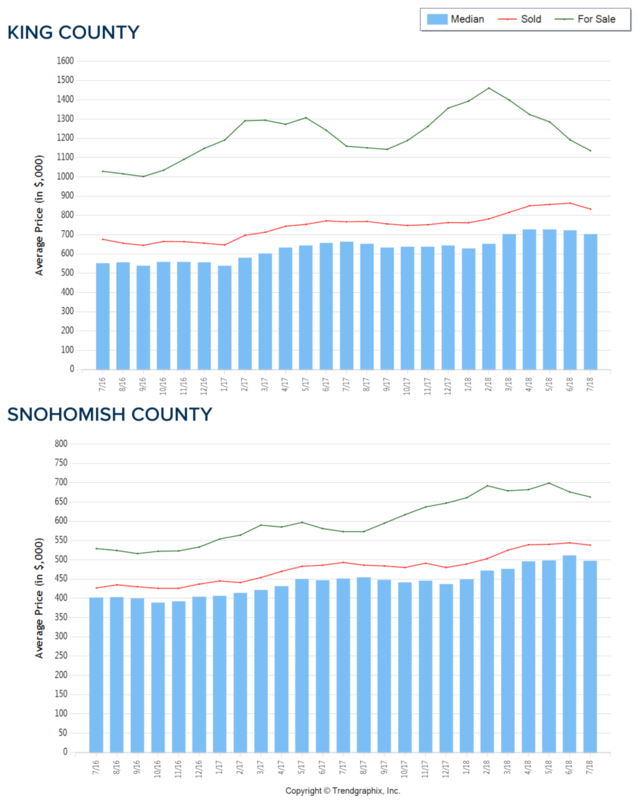 The graphs above illustrate the price growth in both King and Snohomish Counties. 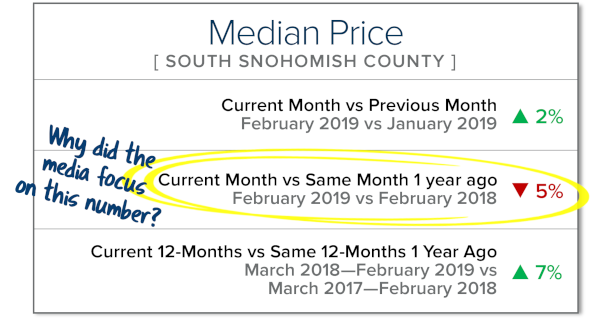 If you average out the last 12 months and compare to the previous 12 months, prices are up 14% in King County and 13% in Snohomish County. Due to a large increase in inventory and other factors, we have seen prices start to balance out since May. Additional factors that play into this healthy adjustment on the run-up of prices are interest rates, affordability, and Seattle summertime. First, interest rates have been dancing. They have climbed over a half a point from a year ago, which has been coupled with double-digit price growth, forcing many buyers to take a step back. Bear in mind that interest rates are still under 5% and well below the 30-year average of 6.61%. This must be taken to heart! Affordability has been a huge factor that played into the reduction of absorption rate once the increase in new listings hit this Spring. This was especially true in King County. Prices peaked so far this year at $725,000 in April, whereas they peaked in Snohomish County at $510,000 in June. This is simple supply and demand, as buyers have had more selection. Further, many buyers turned their heads north to find a more affordable option while still sustaining a manageable commute. The bottom line is that it just got too expensive for some to make King County their home, even Snohomish County for that matter. Combine that with an influx of selection, and you find the top of the market so far in 2018. This is not a bad thing! We must keep the double-digit, year-over-year price appreciation in perspective, and trust that the market factors which led to prices balancing out are healthy. A typical appreciation rate is 3-5%. 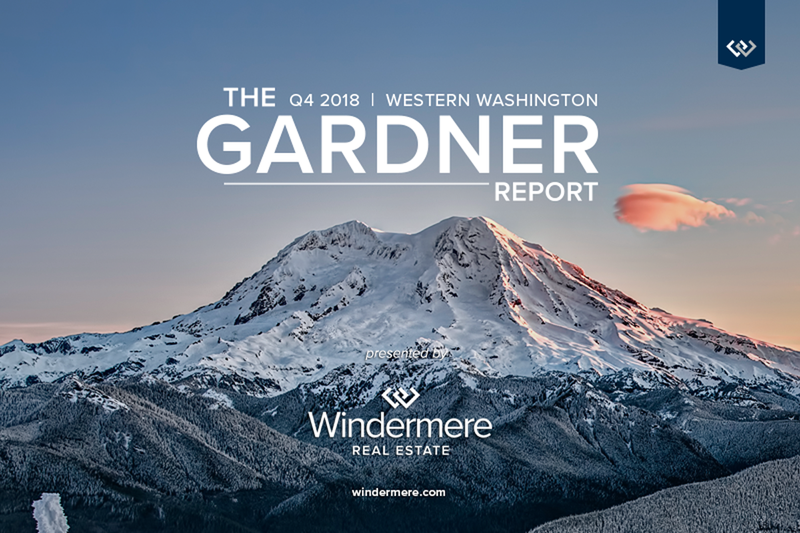 Matthew Gardner, Windermere’s Chief Economist, predicts that we will finish out 2018 with 7-8% appreciation over 2017, which is well above the norm of 3-5%. Sustainable growth is important to the overall health of our economy and culture; this provides opportunity. Buyers take heed. As we come out of the Seattle summertime seasonal slowdown, we anticipate a little run on new listings in September and October. Note on the graph above that we seasonally see prices peak in the late spring and early summer, due to many folks taking time to enjoy the summer months traveling and relaxing a bit. If you have been a sidelined buyer or have been thinking about making a move, the remainder of 2018 may be your time to enjoy more selection, still-low interest rates, and the chance to secure the best home for your lifestyle. Interest rates are still attractive (historically attractive) and are predicted to rise. Plus, selection has increased, making negotiations not as intense. Multiple offers are not always the norm these days, which provides some breathing room for luxuries like inspections and relying on the bank’s appraisal to confirm value. Also, if you are a buyer that needs to sell a home first in order to purchase, this environment is much more forgiving. Believe it or not, we have even started to see contingent offers make a comeback. This was one reason why we saw such a limit on inventory, because folks were not able to make fluid moves, so they just uncomfortably stayed put. It was the many baby boomers who came to market this spring and summer who relocated out of the area that loosened this up, paving the way for the local first-time, move-up, or move-down buyer to have some opportunity to transition. So what does all this mean for potential sellers? Well, a lot! The word of the day is perspective. You must keep a close connection to the double-digit, year-over-year price appreciation we have seen over the last three years, and come to terms with today’s balancing out. Great equity gains are behind every homeowner who has owned their home since 2012. If that equity has been cared for, there are large profits to turn, even though you might not get multiple offers. All it takes is one good buyer for a successful sale! It is all about what is motivating you. If a move seems interesting or imminent, chances are you can take that equity and turn it into something that better matches your current lifestyle. This is where a detailed assessment of the features of your home, along with an analysis of market conditions can be developed into a winning strategy. This does not come easy and requires in-depth research, close attention to condition and comparable homes, and outstanding marketing and merchandising. Where I have seen the most opportunity is when sellers partner up and listen to the professional assessment of all of these factors. It often leads to satisfying results with one buyer, or believe it or not, the occasional multiple offer. Our market is exciting, but it takes skill to set level expectations, which leads to positive results. If you or someone you know is curious about “How’s the Market?”, please reach out. Education and explanation are key to awareness, which leads to clarity. I love what I do and look forward to the opportunity to serve during this changing time. It is my goal to help keep my clients informed and empower strong decisions. We are so fortunate here at Windermere to have Matthew Gardner help keep us informed on our economy and the real estate market. Each quarter Matthew compiles in-depth research on counties from across Western Washington. Click here to download Matthew’s full Q2 report. Summer is quickly coming to a close, and it’s time to think about prepping your yard for fall. Here are a few quick tips to get you started, and a full article here. All summer long, plants and grass are using up nutrients in the soil. After months of growing, your soil’s reserves become depleted, which is why a fall fertilizer is great to restore nutrients and give your grass, shrubs, and perennials a boost to help them make it through winter. It is recommended to fertilize once every season. Late summer and fall might seem like a good time to prune dead flowers and branches, but several experts recommend waiting until spring to prune anything. Pruning stimulates new growth, but with the frost coming, chances are this new growth won’t survive. Pruning also interferes with the plant when it is going dormant. 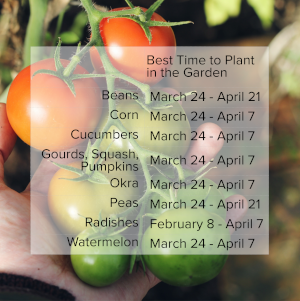 In late September, you should also stop watering your plants to help them go dormant as well. Okay, this isn’t really a yard tip but it’s still important, and after all this smoke – critical! It’s recommended that you change your furnace filter at least every three months, if not more often. Having a clean furnace filter will make the air circulating through your house cleaner, and will put less stress on your heating and air systems. August 8th-10th will be an exciting time in Seattle. Pearl Jam, Seattle’s own original grunge band will be hosting two shows at Safeco Field on August 8th and 10th, and the Seattle Seahawks kick off their preseason schedule at Century Link on August 9th. Besides providing great entertainment for music and football fans, both of these events will give back to the community. The two Pearl Jam shows have been coined The Home Shows as Seattle is Pearl Jam’s home town; but more importantly, proceeds from both shows will be donated to organizations such as Mary’s Place, the YMCA and The Mockingbird Society to help fight homelessness. These organizations have programs in place that are helping to improve the homeless crisis in our city. 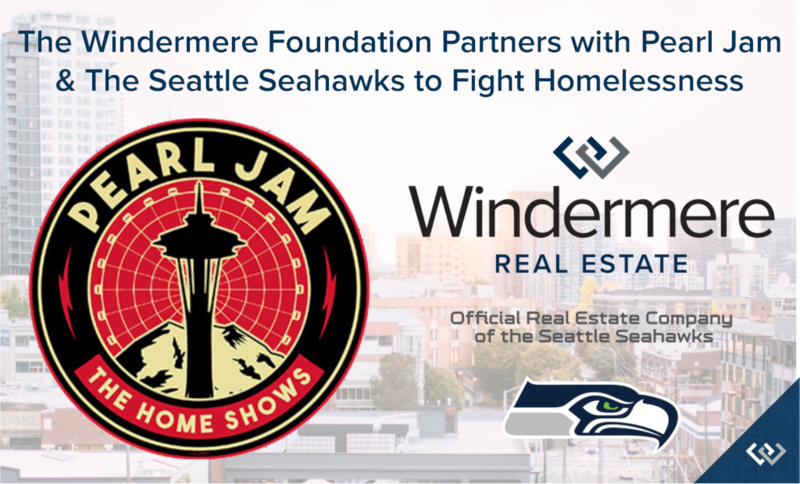 The Windermere Foundation has partnered with Pearl Jam and their Vitalogy Foundation and joined other organizations such as Alaska Airlines, Nordstrom, Tom Douglas, and The Bill and Melinda Gates Foundation to help sponsor these two benefit shows. The Windermere Foundation has always been rooted in working towards overcoming homelessness and helping families and children get back on their feet. The Home Shows aligned with the Windermere Foundation’s mission, making it a natural fit for this partnership. Check out this video of Mike McCready, Pearl Jam’s guitarist serenading Windermere for our partnership. On August 9th, the Seattle Seahawks kick off their pre-season schedule which also kicks off the Windermere Foundation’s third year of partnering with the Seattle Seahawks to Tackle Homelessness. For every defensive tackle that takes place at a regular season home game, the Windermere Foundation will donate $100 towards Youth Care, an organization that helps youth struggling with homelessness or transitional living. Each Windermere office has its own Windermere Foundation fund account that they use to make donations to organizations in their local communities. Our office recently sent 24 low-income children to YMCA’s Camp Orkila and Camp Colman with funds that we raised. These kids will enjoy a life changing week of summer camp, meeting new friends and experiencing the outdoors. These experiences would not be possible without the support of our clients. For each transaction that Windermere closes, the Windermere agent involved makes a donation to the Windermere Foundation. Thank you for your support of my business, it helps make the Windermere Foundation possible! The first day of school sneaks up so fast… summer is here and then gone in a flash! Use these helpful tips to start getting settled into a new routine for fall, before life gets hectic. Start talking about it. New teacher, new classmates, new schedules can all create some anxieties with kids. Start talking about school a few weeks before the first day. Talk about practical things like what the new schedule will be like, but also make sure to address their feelings and concerns about the upcoming year. Go back to school shopping early. The store aisles are currently packed with school supplies. Take advantage of your summer schedule to shop while the store isn’t as busy and the supplies haven’t been picked through. Don’t forget to buy extras for homework time or the winter re-stock that inevitably happens in January. Determine how your child will get to and from school and practice the route. Ease back into the scheduled days. When you and your kids are used to lazy mornings and staying up late, shifting to the early morning school bus rush can be incredibly difficult. To ease the transition, start 7-10 days before school starts, and shift bedtimes and wake-up times gradually. Every day, start their bedtime routine 10-15 minutes earlier and wake them up 10-15 minutes earlier until they’re back on track. And don’t forget to readjust your bedtime schedules, too! Re-set eating habits. When school starts, your student’s eating patterns need to maintain a high level of energy throughout the day. Implementing a routine for breakfast, lunch and snacks is just as important as their sleeping patterns. Begin this transition 7-10 days before school starts as well. 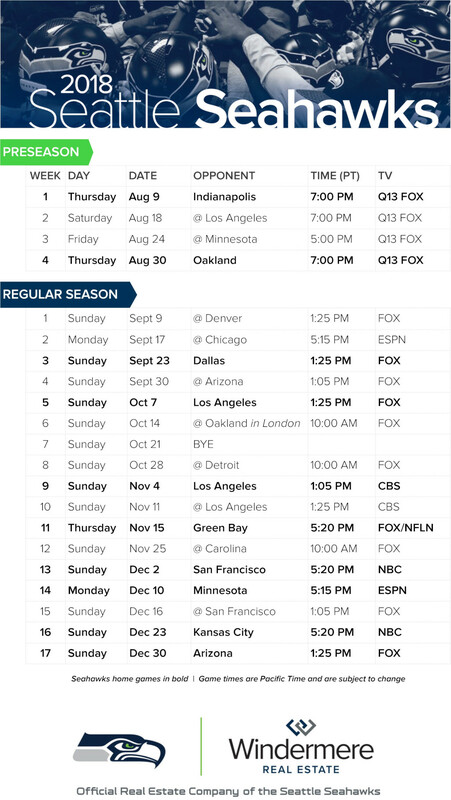 Sync your calendars. Add the school calendar to your personal/family calendar, so important dates like parent-teacher night aren’t missed. Set rules for after school. After-school time and activities such as TV, video games, play time, and the completion of homework should be well-thought out in advance. Talk about the rules (and consequences) for these before school starts. The late spring market brought about some welcomed change to our local real estate markets. In May, we experienced the largest increase in inventory in a decade! North King County and South Snohomish County are two examples of what is happening in all the markets across the Puget Sound as we head into the second half of 2018. Below is a breakdown of the current environment; further is an explanation of what it all means. Median Price up 15% complete year over year, but down 1% vs. the previous month, landing at $815K. Median price up 12% complete year over year, but equal with the previous month, landing at $500K. This increase in inventory is awesome! It is providing more selection for buyers and is helping temper price growth, which was increasing at an unsustainable level. It is still a Seller’s market by all means, which is defined by having three or less months of available inventory. Both market areas are still just under one month of inventory based on pending sales, but not as low as the two-week mark they were experiencing in March. The increase in inventory is the result of pent up seller demand. From 1985-2008 the average amount of time a homeowner stayed in their home was 6 years. From 2008-2017 it grew to 9 years. With a resounding amount of equity under their belts, many homeowners are now deciding to make moves. Some are moving up to the next best thing and others are cashing out and leaving the area for a new beginning or retirement. This is providing buyers with the selection they have been waiting for after a very tenuous, inventory-starved start to 2018. The buyers that have stayed on the forefront of the market are now being rewarded with choices. These choices are best accompanied with keen discernment in order to craft the best negotiations – the broker they choose to align with is key. The price analysis above indicates strong equity positions for sellers, but also a leveling off in price growth. Over the first quarter we saw prices increase month-over-month quite handily; now that more inventory is appearing and demand is being absorbed, price growth is not as extreme. This has highlighted the importance of having a strategic pricing and marketing plan for sellers wanting the highest price and shortest market time. The broker they choose to align with is key. The importance of both buyers and sellers aligning with a knowledgeable, well-researched and responsive broker is paramount. One might think that it is “easy” to sell a house in this market, but the pricing research, home preparation, market exposure, varied marketing mediums, close management of all the communication, and how negotiations are handled can make or break a seller’s net return on the sale. 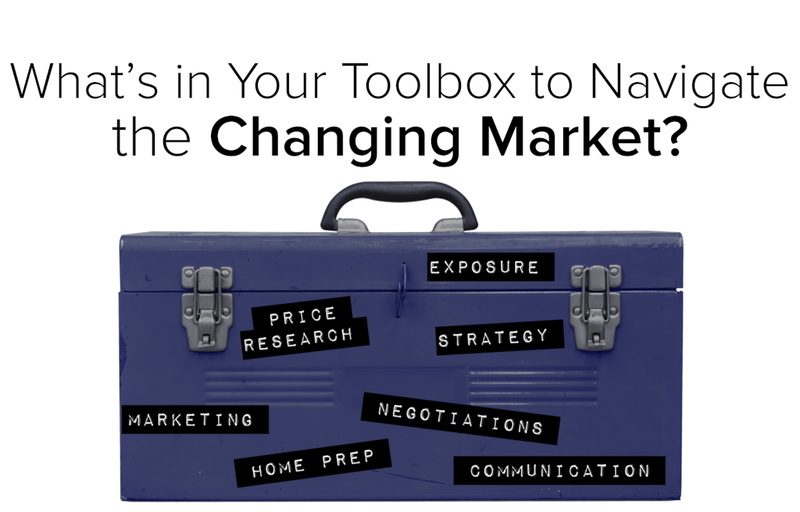 With market times increasing, having a broker with a tight grasp on the changing environment will help create an efficient market time, resulting in the best price and terms for a successful closing. It is important that sellers do not overshoot this market, and it takes a broker with a keen gut sense rooted in in-depth research to help get them their desired results. If you’re a buyer, it is overwhelmingly important that you are aligned with a broker that knows how to win in this market. The increase in selection has left some room for contemplation in some cases. Considering possible terms and price based on thorough market research as you head into negotiations are what set a highly capable selling broker apart and are required to prevail. With more selection coming to market, buyers have more to consider, and having a broker alongside them to help craft a strategy of negotiations will ensure they don’t overpay. If you have any curiosities or questions regarding the value of your current home or purchase opportunities in today’s market, please contact me. It is my goal to help keep you informed and empower strong decisions. On June 8th, my office spent our annual Community Service Day with the Snohomish Garden Club constructing trellises, weeding and staking beds and planting and labeling a half-acre of produce! The Snohomish Garden Club will harvest this half-acre, which will yield close to 10,000 pounds of fresh produce to be donated to various food banks and senior centers in Snohomish County. The land for the garden is generously donated by the Bailey Family Farm. 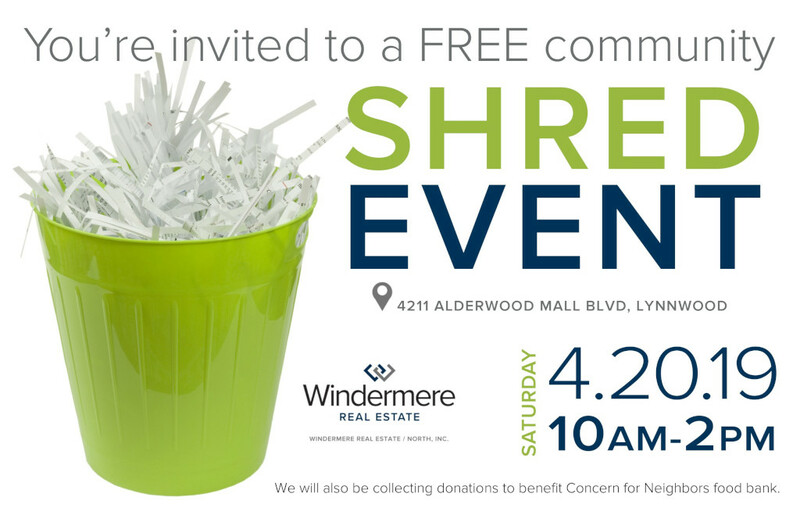 Windermere’s Community Service Day was established in 1984 to offer agents and staff a chance to volunteer an entire workday to give back to the neighborhoods in which they live and work. Have you had dreams of owning a home or know someone that does? Jumping into the market as a first-time home buyer can be intimidating, especially within the wild ride of the Greater Seattle market; but there is hope! In an effort to illustrate the reality for first-time buyers in today’s market, my office got together and identified several sets of buyers who recently found success in today’s market and asked them to share their stories. We think this is timely because it is the time of year that we see a surge in inventory, which gives buyers more selection and opportunity. We have two stories to share below, but before we dive into those let’s defy some first-time home buyer myths. First, many people think it is necessary to have a 20% down payment saved in order to make their first purchase. That is simply not true. While a 20% down payment can help make you more competitive and naturally lowers your monthly payment, it is not the only option. There are loan programs with down payments as low as 3%. Nationally, in March the average down payment for all loans was 10%. For first-timers it was 6% and repeat buyers it was 14%. Second, expectations around credit scores can use some clarification as well. In March, the average credit score for all loans was 722. For Conventional loans it was 742 and for FHA it was 677. If your credit needs some work, contact me and I can put you in touch with one of my preferred lenders that can help with credit repair. There is hope, as these numbers are just the average. You’d be surprised that you don’t have to have perfect credit to get the process started. Lastly, the cost to be a renter is high, and the return on your investment is nothing. Recently, Rent.com did a survey of landlords and 88% said they planned to raise their rents in the next 12 months. In the same survey, 53% said they’d rather place a new tenant with a higher rent versus renegotiate and renew with a current tenant. This sounds expensive and unstable. Owning leads to building wealth and putting down permanent roots. Now that we’ve gained some clarity on what it takes to qualify in today’s market, let’s jump into these two honest, yet heartwarming local first-time home buyer stories. This happy family of five just moved in to this house earlier this month. Two hard working parents, Brandy and Juan, with three teenagers were renting a 3-bedroom, 1-bath rambler in Edmonds and needed more space. It was time to make a move, and they had saved up a 3% down payment for a new home. Their budget was $400,000. The first step in the home buying process was sitting down with their agent for the initial buyer consultation. This is where they discussed market conditions, desired features such as bedrooms, bathrooms and garage, and their budget. This lead them to explore which locations had the inventory that met their needs in order to stay within their budget. They had to marry these three key points – we like to call this the Triangle of Buyer Clarity. They then identified a few workable locations that had inventory which supported their desired features and their budget and went for it. This upfront research and partnership with their agent lead to Brandy and Juan finding success rather quickly, saving them money in an appreciating market, and a whole lot of strife. They did this and ultimately bought a great house in Marysville which fit their budget, afforded them the features they desired, and still provided a manageable commute into Lynnwood. Their mortgage payment is higher than their rental rate, but relative to the size of their new home and their investment. Not to mention, they are now on the equity-building train and don’t have to worry about a landlord displacing them. Their monthly mortgage payment is fixed with an awesome low interest rate, and they are super happy to have more than one bathroom for their teenagers. First, how cool is this house? Super cool! That’s just how Paul and Ange feel about their newly purchased home in the Highland Park neighborhood of West Seattle. They just closed in early April and have already attended two neighborhood BBQ’s, received gifts from their new neighbors, discovered new parks and restaurants and, wait for it…shortened their commute. Paul described his new neighborhood, Highland Park, as “magical.” Previously, Paul and Ange were renting in Wedgwood for six years and loved it there. So much that they could not imagine living anywhere else. When they started their home search in late 2017, they kept to strict search criteria of North Seattle because that is what they knew and it was comfortable. After making two offers and not prevailing because they were getting beat out on price, West Seattle was suggested to them as a more affordable option by their agent. The price corner of the Triangle of Buyer Clarity was making itself known as a challenge in North Seattle, so it was time to reconvene. They sat down with their agent and evaluated the market conditions in West Seattle compared to North Seattle and applied them to their feature list and budget, and voila: West Seattle was calling their names. You see, they wanted a more turn-key home, and the homes they were encountering in their price range in North Seattle needed a lot of work. They went out on a limb and traveled over the bridge to start looking at homes. They quickly saw the difference – the homes they were interested in were not, as Paul said, “scary”! The anticipated repairs they would have to make to the homes they were able to afford in North Seattle were daunting and unexciting. They felt much more at ease with the features that the West Seattle homes provided within their price range. They just needed to get comfortable with the idea of moving to a different community. When they found the house featured above, the leap of faith to West Seattle started to take shape. They prepped a strong offer, did their due diligence, and believe it or not, secured the home in a multiple offer situation at $805,000, which was not the highest price! They listened to their agent and wrote an offer with very strong terms as well as a very well-researched price. Their agent kept in close contact with the listing agent and the Sellers chose their offer due to all of these factors. Since moving in almost two months ago, they find themselves in a state of excitement and discovery every day. The community has been welcoming and conversations with neighbors and the random stranger at the grocery store come easily. Paul has observed a strong sense of curiosity within his new community as people are new to the area and are encouraged to build relationships and make discoveries. In the end, Paul and Ange remained within their price range, bought a home with all the features they wanted, but made what seemed to be at the time, a compromise on location. That compromise ended up being, as they put it, magical! They have never looked back to Wegdwood with regret, only excitement over what their new neighborhood might bring. The point of these two stories is to debunk the sentiment we hear from time to time, that first-time home buyers cannot find success in our market. With a well-laid-out plan strategically constructed by the agent and client, we are seeing many happy stories for first-timers. The end result is putting these new homeowners on the path to building wealth, growing thriving communities, and making their house their home. If you or someone you know has dreamed about buying their first home, please reach out. It is my goal to help identify the opportunities that are available, the strategies that find success, and to educate along the way. We are so fortunate here at Windermere to have Matthew Gardner help keep us informed on our economy and the real estate market. Each quarter Matthew compiles in-depth research on counties from across Western Washington. Click here to download Matthew’s full Q1 report. 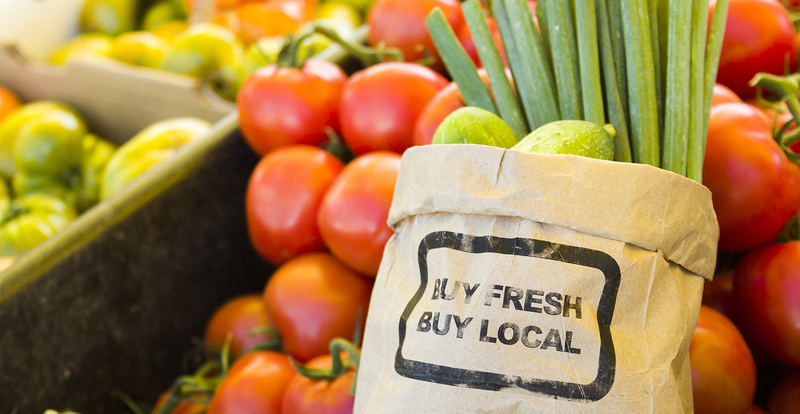 When you shop at a local Farmers Market, you’re buying outstanding freshness, quality and flavor. Knowing exactly where your food comes from and how it was grown provides peace of mind for your family. Plus, you’re supporting a sustainable regional food system that helps small family farms stay in business; protects land from development, and provides the community with fresh, healthy food. Find one near you!